Donald Trump’s political fortunes changed in an instant after the Justice Department announced that Special Counsel Robert Mueller hadn’t found evidence that the president or his campaign colluded with Russia to interfere with the 2016 election. Trump’s oft-uttered and equally oft-mocked claim — “no collusion” — proved true. The president won’t face re-election under a cloud of distrust about his connections to the Kremlin. He and his staff are freed from an investigation that preoccupied his White House. 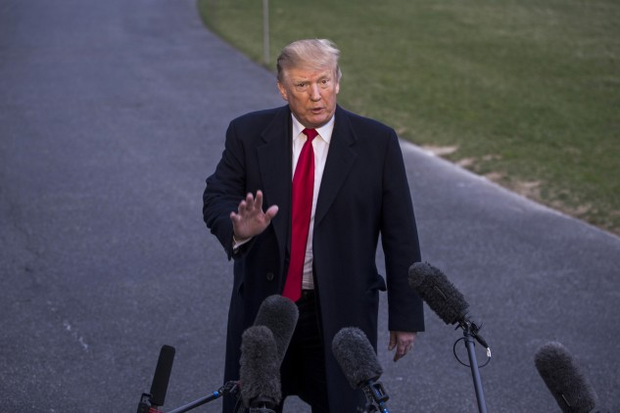 Democrats who had long hoped Mueller’s report would provide enough ammunition to politically handicap the president, if not impeach him, face new questions about their own credibility after years of insinuations and conspiracy-mongering. The opposition party must re-calibrate not only its approach to the Russia investigation, but also its messaging on a host of fresh investigations House Democrats have launched into the Trump administration and the financial affairs of the president and his family. The hope for Trump, and the danger for Democrats, is that probe-weary voters may feel that Mueller has spoken and it’s time to move on — just in time for his 2020 re-election campaign to begin in earnest. That’s a distinction without a difference in the Oval Office, where Trump’s absolution in the inquiry reinforces his political brand, long rooted in personal grievance and his depiction of himself as a victimized outsider. Justin Sink has more on what the report means for Trump. Trump spoke to members of the media on the South Lawn of the White House on Sunday. Democrats’ Plan B: Mueller’s final report robbed Democrats of what they hoped would be a devastating blow to Trump. And, after defending the special counsel’s integrity for more than a year, they have little room to challenge his conclusion there was no conspiracy between Trump’s campaign and Russia in the 2016 election. Yet, even before the special counsel’s 22-month probe ended, Democrats were already working under a Plan B to undermine Trump going into the 2020 presidential race, through investigations led by House committees now under their control. The strategy poses risks for the Democrats, particularly if voters prove tired of talk of investigating Trump now that Mueller has completed his work. In addition, the probes could overshadow their agenda, particularly on issues like health care that helped the party take back the House in 2018. Read more from Billy House. What’s In Barr’s Summary: “No collusion” may have been the biggest headline, but there are many other questions about Mueller’s investigation. Steven T. Dennis and Ben Brody provide eight of the biggest questions and how Attorney General Barr did — or didn’t — answer them in a four-page summary sent to Congress yesterday. Read more. New York Probes in Focus: Trump now has to contend with the Strauss investigation. Audrey Strauss, named the No. 2 federal prosecutor in Manhattan at the end of last week, inherits some of the most perilous remaining investigations into Trump. While Mueller’s probe delved into the Trump team’s possible collusion with Russians who interfered in U.S. elections, he spun off other investigations, including a look at Trump campaign finances that’s now being overseen by Strauss. Peter Jeffrey and Andrew Martin have more. Russia Sees Opportunity: Russia urged Trump to take the opportunity after Mueller’s report to reset relations. “There’s a chance to renew much in our relations, but the question is whether Trump will take the risk,” Konstantin Kosachyov, chairman of the international relations committee in the upper house of parliament, wrote today on Facebook. “We, of course, are ready. And I suggest starting with the most acute issues: the START and INF agreements” limiting nuclear weapons, he said. Read more from Tony Halpin. MMT Makes Democrats Curious: Expensive measures such as “Medicare for All” and the Green New Deal are among the issues facing the House Democrats who will weigh the fiscal aspects of the party’s most ambitious ideas now that they control the majority. But the rise of Modern Monetary Theory within the party has some lawmakers wondering whether it even matters whether those programs increase the deficit, as long as the country isn’t at risk of significant inflation. Modern Monetary Theory, or MMT, is almost never mentioned specifically by members of Congress who negotiate budget and appropriations measures, but it is working its way into the mainstream political debate. Now, it’s gotten some Democratic lawmakers’ attention as the party considers big-ticket policy priorities. That includes House Budget Chairman John Yarmuth(D-Ky.), who will decide over the next few weeks whether to produce a fiscal 2020 budget resolution that maps out the caucus’s fiscal vision for the future. Read more from Jack Fitzpatrick. Dems to Unveil Health Plan: House Democrats plan to unveil health-care legislation tomorrow aimed at lowering costs and protecting people with pre-existing conditions, according to an advisory from the office of Speaker Nancy Pelosi (D-Calif.). The bill, broadly timed to coincide with the 9th anniversary over the weekend of Obamacare being signed into law, would “reverse the Trump administration’s health-care sabotage, and take new measures to lower health premiums and out-of-pocket costs for families,” according to the statement, Kim Chipman reports. Dems to Boost Oversight Funding: House Democrats are moving to beef up funding for committees, including several panels that will be central to their goal of more aggressive oversight of Trump’s presidency. The proposed boosts in spending are included in a resolution that the House Administration Committee is scheduled to mark up today. The resolution covers all the House committees except Appropriations; by tradition its allotment is handled separately. The House Oversight and Reform Committee, which has jurisdiction to investigate wrongdoing inside and out of government, would get a 4 percent spending increase over levels set by the Republican-controlled House during the last two years. The Judiciary and Intelligence committees, two other panels spearheading the investigations of allegations of abuse of power by Trump and ethical wrongdoing by some top appointees would receive 3 percent spending increases. Read more from James Rowley. Democrats’ Tax Priorities: Ways and Means Democrats have rolled out a series of tax hearings since they took control of the House in January. That’s easy enough. The more difficult task for the House Ways and Means Committee begins now, as Rep. Richard Neal (D-Mass. ), its chairman, embarks on committee votes for legislation he hopes to advance. It isn’t clear what tax policy goals committee Democrats will be able to check off in a divided Congress. But the Democratic majority in the House gives the tax-writing committee leverage to try to move forward on its goals. Read more from Kaustuv Basu and Allyson Versprille. VA Technology Hurdles: A caregiver expansion is the latest casualty of aging information technology infrastructure at the Department of Veterans Affairs, forcing a delay as lawmakers grow impatient with the agency. VA Secretary Robert Wilkie is preparing to face senators for the first time since the caregiver expansion delay was announced, with a hearing on the department’s budget set for tomorrow. Wilkie will also appear at a House Appropriations Subcommittee hearing on Wednesday. Lawmakers will likely have plenty of questions about what the department is doing to get resources to those who care for wounded veterans. Megan Howard has more on the state of the VA.
Fannie and Freddie Fix: A Fannie Mae and Freddie Mac fix is on Washington’s agenda — again. Congress this week kicks off its latest attempt to forge a path forward for the mortgage giants, something that’s proved extremely elusive in the 11 years that the companies have been under U.S. control. Starting tomorrow, Senate Banking Committee Chairman Mike Crapo (R-Idaho) will hold two days of hearings on his plan for returning Fannie and Freddie to private ownership and giving the government an explicit role in backstopping the housing market. Read more from Jesse Westbrook. Senate Dems Target Wells Fargo: Sen. Elizabeth Warren (D-Mass.) is again taking aim at Wells Fargo CEO Tim Sloan, this time asking federal regulators to invoke their power to make management changes. The Democratic senator and presidential candidate joined Sen. Sherrod Brown (D-Ohio) to send letters to the Office of the Comptroller of the Currency and the Consumer Financial Protection Bureau Friday urging them to remove Sloan. Warren has repeatedly called for Sloan’s ouster since he rose to the top job in 2016 as the bank found itself embroiled in a series of customer-abuse scandals. The OCC has the power to make executive changes as part of an April 2018 consent order. Read more from Hannah Levitt and Sahil Kapur. AIPAC Opens Amid Israel Attack: The annual AIPAC is drawing attention to Trump’s contentious shift in U.S.-Israeli policy ahead of an election there, and a clash among Democrats over support for the Jewish state. The pro-Israel lobbying group’s three-day meeting in Washington kicked off yesterday and will feature speeches from Vice President Mike Pence, Secretary of State Michael Pompeo, and the Democratic and Republican leaders of the House and Senate, as well as Israeli officials. Conspicuously absent are the many congressional Democrats running — or weighing a bid —for president. Read more from Sahil Kapur. Meanwhile, a rocket from the Gaza Strip struck a house in central Israel before dawn, forcing Prime Minister Benjamin Netanyahu to cut short a U.S. trip where he had hoped to showcase his diplomatic stature ahead of April 9 elections. The rocket destroyed the house but its residents escaped serious injury because an air raid warning siren gave them a brief window of time to flee. The biggest damage on the eve of elections may have been to Netanyahu’s domestic reputation as the guardian of Israel’s security, as it was the second attack on Israel’s heartland in less than two weeks. Netanyahu, who traveled to Washington for the AIPAC Conference, vowed a strong response. “This was a criminal attack on the state of Israel, and we will respond forcefully,” the prime minister said in a video provided by his office. He’ll meet with Trump this morning, but will leave the U.S. without delivering a speech to AIPAC in person. Read more from Gwen Ackerman. Gillibrand has struggled to break through a crowd of Democratic presidential hopefuls that already includes the party’s 2016 runner-up and a handful of candidates widely known by their first names, and is likely to be soon joined by a former vice president. While people close to her campaign resist casting yesterday’s speech as a reset, it’s an opportunity for Gillibrand to jump-start her candidacy and show voters that she’s ready to take on the president in a Democratic primary race that will ultimately hinge on voter’s assessment of the candidates’ ability to beat him. Read more from Jennifer Epstein. Fed Pick Draws Scrutiny: Stephen Moore drew swift and unusually pointed criticism after Trump picked him to be a governor of the Federal Reserve, with at least one prominent Republican economist calling on the Senate to block the appointment. “He does not have the intellectual gravitas for this important job,” Greg Mankiw, a Harvard professor who was chairman of the White House Council of Economic Advisers under President George W. Bush, wrote in a blog post on Friday. “It is time for senators to do their job. Mr. Moore should not be confirmed.” Read more on the reactions from Brendan Murray. U.S. Plans Missile Defense Test: The Pentagon is about to attempt what’s likely to be the most challenging test yet of the U.S. military’s ability to shoot down an incoming missile from an adversary such as North Korea or Iran, according to three people familiar with the plans. The Missile Defense Agency intends today to fire two interceptors tipped with the latest Raytheon warheads within seconds of each other in a test that hasn’t been publicly announced. The first interceptor would attempt to crash into a dummy target representing an incoming intercontinental ballistic missile. The second would use its sensors to detect another ICBM or other countermeasures. The action would be the first missile defense test since a successful one in May 2017. The system also scored an interception in June 2014 after two that failed in 2010. Read more from Tony Capaccio. U.S. Claims Islamic State Defeat: The final swath of territory once held by Islamic State in Iraq and Syria has been liberated, the Pentagon said, hours after a largely Kurdish fighting force in Syria claimed victory. Saturday’s statement by acting Defense Secretary Patrick Shanahan followed one by Trump. Unlike the president, who’s said for months that victory had been achieved, it was the first time the U.S. military has proclaimed that the terrorist group no longer holds land it called its “caliphate.” Read more from Dana Khraiche and Vivian Nereim. Report Says Trump Plans D-Day Trip: Trump is expected to attend the 75th anniversary of the Normandy landings on June 6, Le Parisien reported on its website, citing unnamed local officials who have been asked to plan for his presence, Gregory Viscusi reports. Trump’s attendance isn’t confirmed, and neither the French president’s office nor the foreign ministry would comment, Le Parisien said. It would be Trump’s third visit to France as president, after he attended the Bastille Day parade on July 14, 2017, and then returned in November 2018 for the 100th anniversary of the end of WWI. Boeing Plans to Meet Regulators: Boeing plans to meet this week with customers and regulators to explain plans for getting its 737 Max back into service, after the aircraft was grounded following two deadly crashes in less than five months. The plane maker invited more than 200 pilots, technical leaders and regulators for an informational session Wednesday in Renton, Washington, Boeing said in an emailed statement. The company said it met Saturday with some U.S. and overseas customers. Read more from Kyunghee Park. Trump Seeks Twitter Blocks: The president doesn’t take kindly to his Twitter critics, and like many users of the social network he’s used the block function to prevent them from engaging with him. But for much of the past year, Trump has been constrained by a federal judge’s ruling that he couldn’t block users because his account is a public forum. Tomorrow, lawyers for the president will urge an appeals court in Manhattan to overturn that ruling, arguing that the account belongs to him personally and isn’t controlled by the government. The case is likely to help further clarify how government officials will be able to communicate on social media as the networks become further ingrained in daily life. Read more from Chris Dolmetsch. FEMA Releases Personal Data: The Federal Emergency Management Agency improperly released the personal data of some 2.3 million survivors of hurricane and wildfire disasters to a contractor, the Department of Homeland Security’s internal watchdog said late Friday. Personal details including individuals’ home addresses and bank account numbers — data that exposes victims to potential identity theft and fraud — were improperly given to a contractor hired by FEMA to provide temporary housing to victims of hurricanes Harvey, Irma, and Maria and California wildfires in 2017, according to a memo released on Friday by the Department of Homeland Security’s Office of Inspector General. Read more from Ryan Beene.